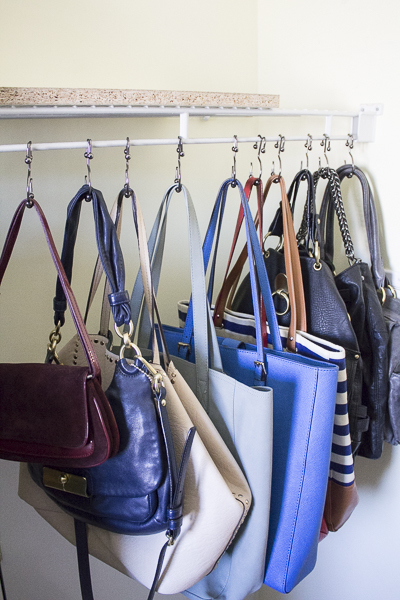 The following is a guest post about how to inexpensively organize purses from regular contributor, Yuni at Love Your Abode. 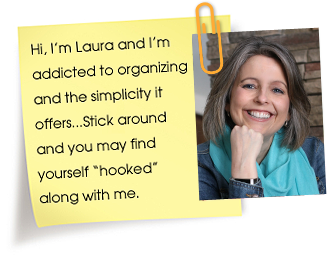 Hi friends, it’s Yuni from Love Your Abode and today, I want to share a simple way to organize all of your purses. I did this a couple of years ago and I have found it’s the best way to organize all of my handbags. My closest is nothing fancy but I’m grateful to have my own space. Do you want to see how my purses used to be stored? After a while, this “method” wasn’t working anymore due to a few reasons. Apart from looking ugly, throwing them all in a bin didn’t keep my handbags in the best shape. They became squished and a lot of them would lose shape and form. Plus, I would forget about the bags sitting on the bottom of the bin. 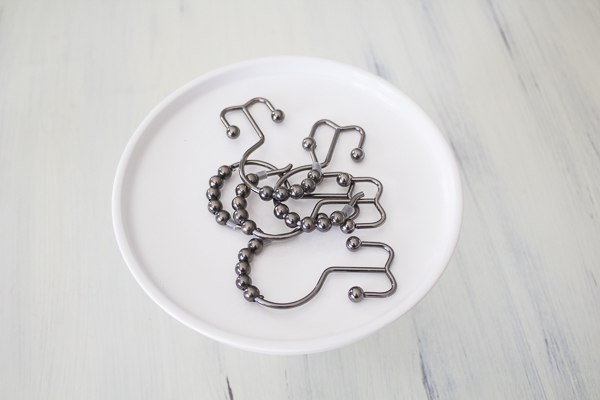 To get your purses organized, all you need are some simple curtain hooks from the store. I found these and hung them upside down in the closet. 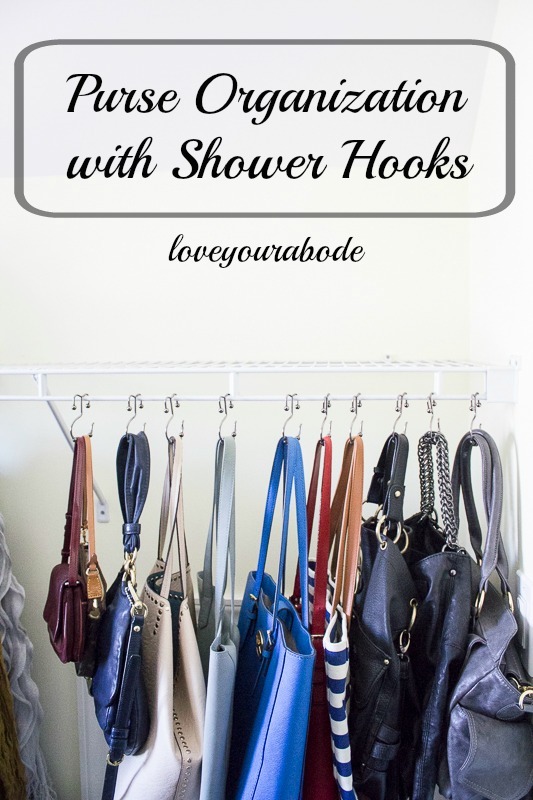 You want to make sure that you buy the right type of hooks that have an open end because that’s how you will hang the handbags. This particular style will most likely be in metal form and not plastic. 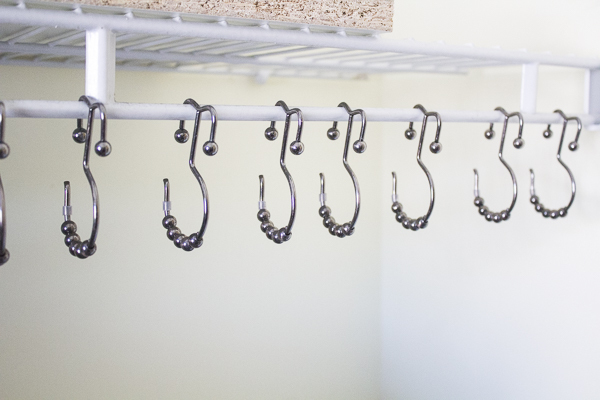 Hang them upside down and put some space in between each hook. I turned the open hook towards the back because it looked cleaner that way. 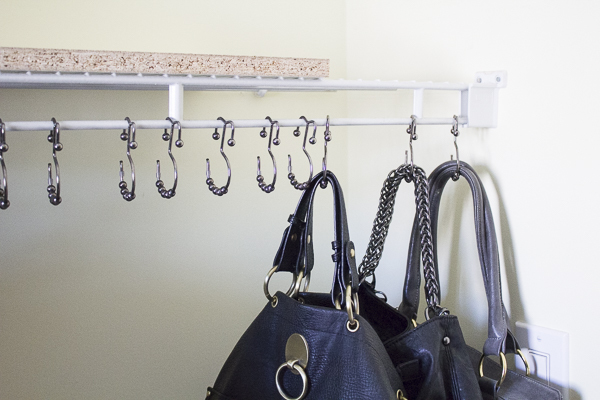 Starting from the end, hang each handbag off the hook. This is also a great time to clean out those purses and you may find some lucky treasures like money or lost jewelry. 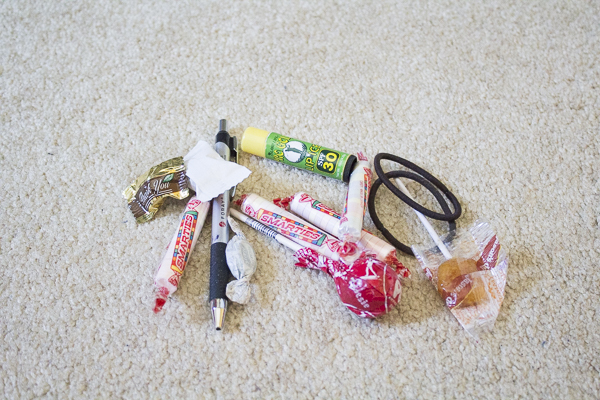 I only found some old candy, chapstick, hair ties and a super old protein bar (not pictured because #gross). This is also a great time to donate old or unused purses. Just like clothes, if you haven’t carried it the last year, you probably should donate or give it to someone else who can use it. 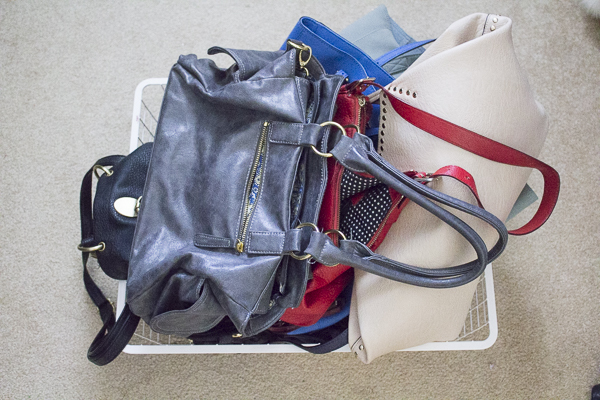 Now, it’s not only easier picking the bag I need, they’re better maintained and organized in a pretty and functional way. 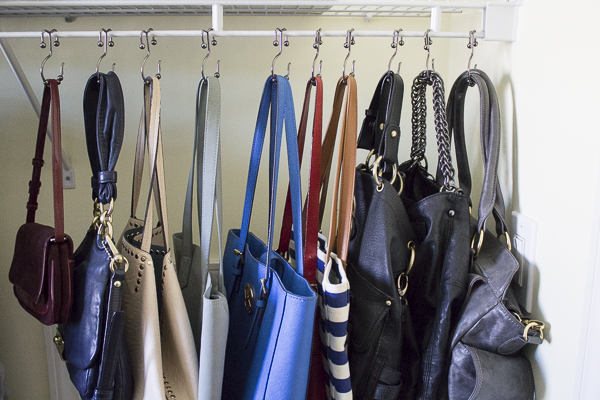 Do you have a way to organize your purses? Hope you found this post helpful. Have a blessed day, friends! Right now I have two purses and a cross over purse. One in use and the other two are somewhere laying down in closet. Where I know where they are. Good idea though for what you have. 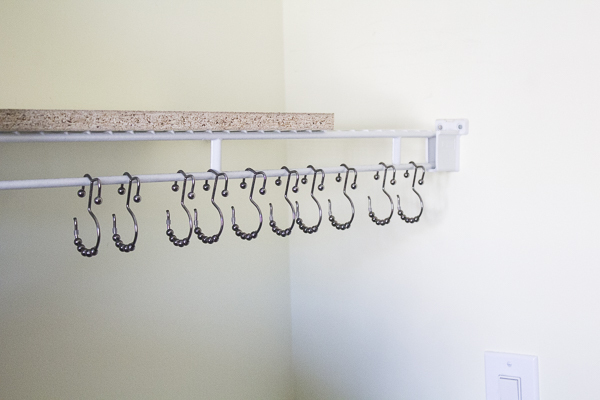 I got a couple closet hooks sometime back from The Container store to use for my camera bag and a few other bags. I really like them and it keeps them off other items, like blankets and luggage that’s below them. just started using shower hooks for my closet. your handbag tip is terrific! thank you.